The best tips and tricks are those that are easy, inexpensive and make a positive difference in everyday life. And often times these little fixes are derived from a moment of weakness or frustration, but you see, that is the best part! It is fun to squeeze those lemons once in awhile. 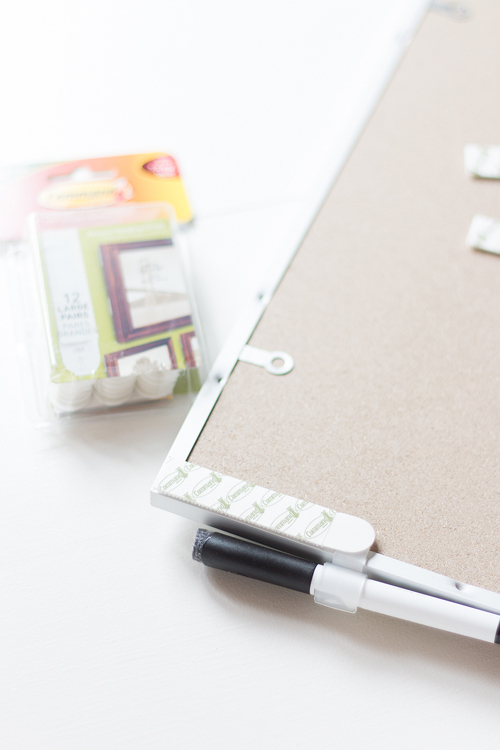 And we all know by now that I simply adore everything that my friend Courtney does, from her big projects down to her little life hacks, and her tips today are no exception. Here she is now to share how she is already making lemonade in her new home. Hey, I Heart Organizing Readers!! I thought it would be fun to share two extremely simple ideas that we recently implemented in our new home. Both were born of necessity and I already have friends implementing them so I thought it would be fun to share over here as well. One involves a new use for a sponge holder and one is just about thinking outside the box. Outside the cereal box! You'll see what I mean. So here is the thing. We live in a world where our cell phones are always on hand. I wish that weren't the case but it's just the reality of things. 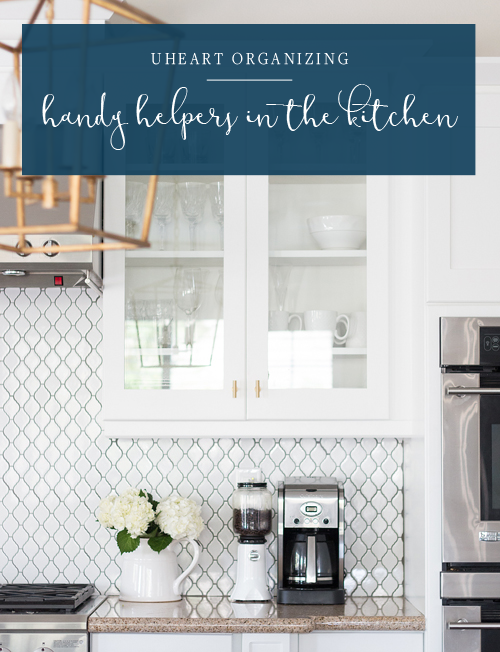 When I am cooking in the kitchen I always have it nearby because I am either looking at a recipe or if the children are off to their activities I need the adult in charge to be able to get a hold of me. But I kept running into issues. Either I couldn't find where I put my phone down or it was getting wet and messy amidst my cooking mess. I don't have a huge amount of space near my stove so I like to keep it clutter free. Here is what my counter usually looks like. No phone to be seen, right?! Ahhhh. This is my favorite part. Enter the sponge holder! 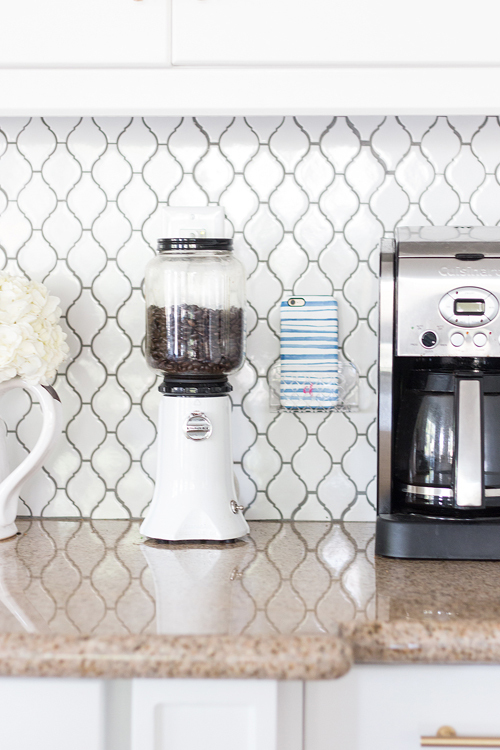 Slide my coffee maker to the side and the clear sponge holder is there in all it's glory. It's simply suction cupped to my tile. Yep. And it has not fallen once (although that could happen I suppose so let it be known I warned you). My husband thinks I am crazy for how happy this has made me. But now my friends have them, too and they are just as happy. I picked this one up at Target. Nothing special about it other than the fact that it has changed my life in the kitchen. I actually find that I stop carrying my phone around with me in the house, too. Unless I am going out, I keep it here. It's off of the counter and can no longer get wet and I can even charge it from here. Because it's clear, you can see the entire screen and I can reference a recipe if I need, to. I also can glance over if I get a text and see if it's something I need to respond to immediately or if it's something that can wait until I am done cooking or prepping meals. In true Jen fashion, I had to wrap my cord with washi tape! This cute navy floral print came in a pack of three from Target. So what do you think? 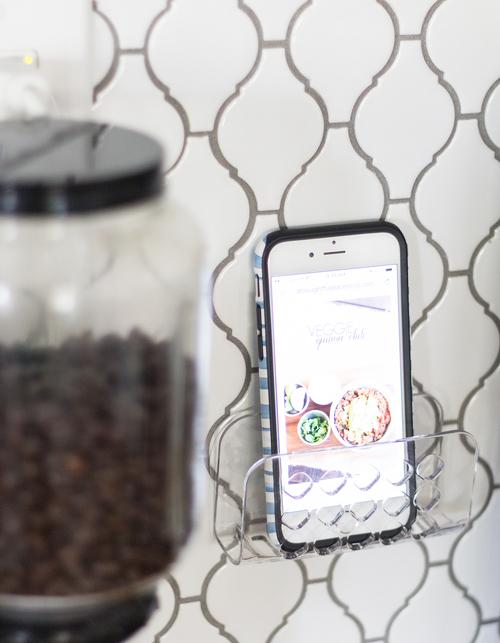 Do you have a spot where a sponge holder could serve as your iPhone holder? 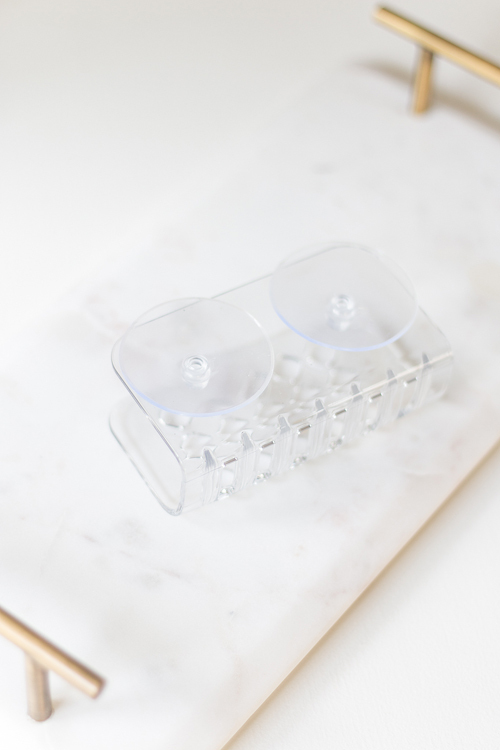 If you can not suction cup this, you could remove those suction cups, turn the holder around and hang it with the small command metal hooks. They would slip right through those holes! In our last home, we were in a groove with where we had our command center. We are still figuring that all out in this home and things were slipping through the cracks. A missed piano lesson while I was traveling was the impetus for this new system. I know that a calendar is nothing new, but for us it's thinking outside of the box and placing it where the children will see it EVERYDAY. Do you see what the dry erase board is next to?! Yep. The cereal. My children eat cereal every morning, even if they have a hot breakfast, too. It's the first thing they eat when the get up at 6:00 am and we are still in bed. So, it's the cereal that dictated this move. I picked up this weekly calendar from Target. I chose not to use the adhesive strips it came with as we just refinished our kitchen cabinets and I didn't want to damage them. So I picked up some of the picturing hanging Command strips. I also ditched the marker it came with as it did not work very well. Just FYI in case you see the same calendar when you are out and about. I also added some washi tape for color. Might as well make it pretty, right? It fits perfectly in our space and we can now see all of the kids' activities in one spot. 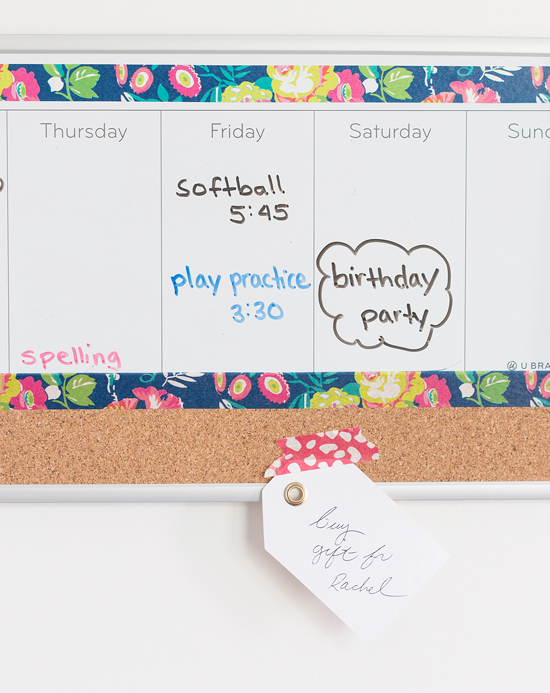 We also have reminders of things that need to be accomplished with the kids. We don't keep everything on this but just the after school events as well as reminders like library book day at school. So far so great and we are not forgetting any commitments. Best of all, this is transferring the responsibility to our children a bit as they are in charge of checking this before and after school. All thanks to cereal and snacks, they really can't avoid seeing their calendar! No more excuses. 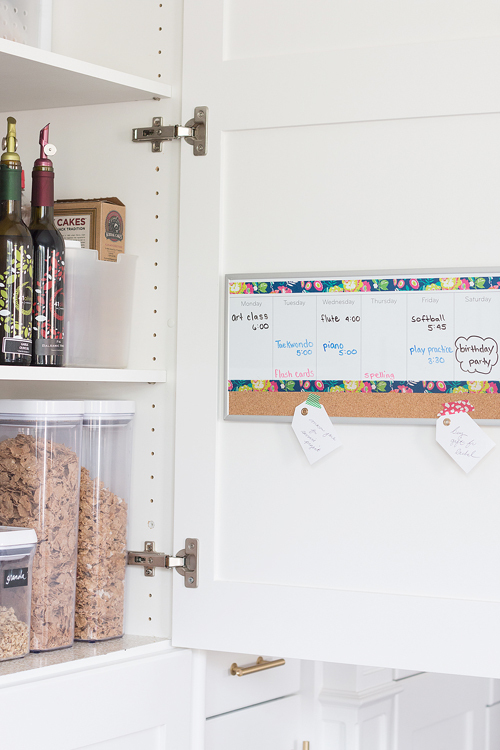 Simple, simple, simple but these two changes in our kitchen have made a world of difference. I hope they inspire you to look for a really quick and easy solution, too. 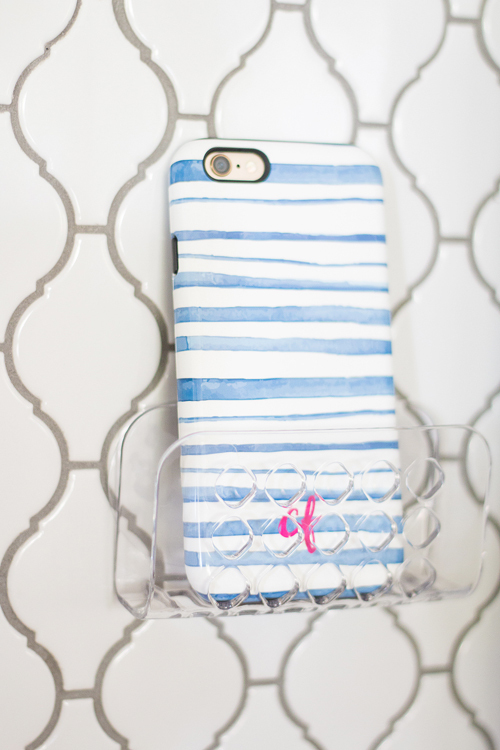 LOVE your phone/sponge holder idea, and also your phone case... Will you share your source? Hi Sara. Thank you. That is from Pretty Smitten. 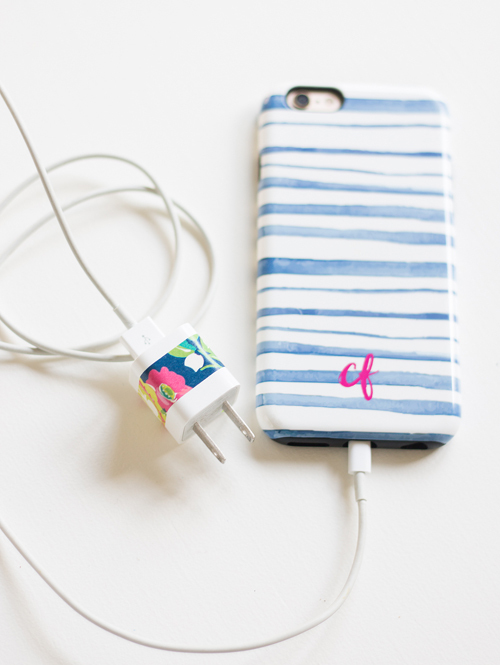 She does darling cases (and other cute personalized things, too). Hope that helps. 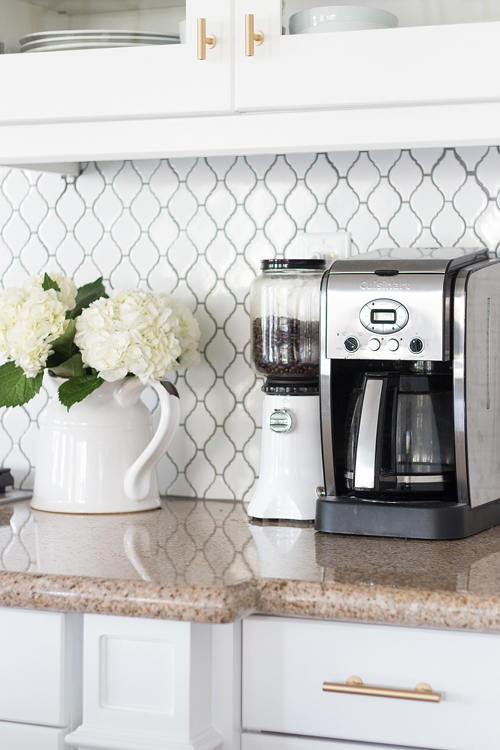 I'm in love with your countertop coffee grinder! What brand is it? Hi Jane! That is Kitchen Aid. We have been very happy with it. Hope that helps. Enjoy your weekend. I second this....that grinder looks amazing, I am curious how it works? I'm searching for Kitchenaid coffee grinders and do not see it. Might be me being dense, but would love some direction. Been on the lookout for a countertop grinder that's pretty. Thanks!! I love the sponge holder idea!!! Thank you, Bonnie. So simple, right. But it's been so helpful. That sponge holder is seriously genius! I know I will make my husband very happy by not having to ask him 20 times a day if he's seen my phone or stressing myself out because I can't find it. Love this tip and love Courtney. Using a sponge holder is flippin' GENIUS!!! My eyes just about popped out of my head..lol. I think I will also place one next to my bed since I dont have a very big nightstand and laying my phone there takes up a lot of room. I also have the baby monitor and ipad there, so it looks like a command center!! This will help with the clutter! I like your calendar but I don't see it on Target's website. Did you get it recently? Thanks! You're very welcome. Have a great week. I'm so happy to hear it can help! I use it every. single. day. So clever! I never thought of using a sponge holder for my phone.This will come very useful at home. Thanks for always sharing great ideas Courtney. Genius! While charging, my phone sits on the counter near the sink while attached to the power source. 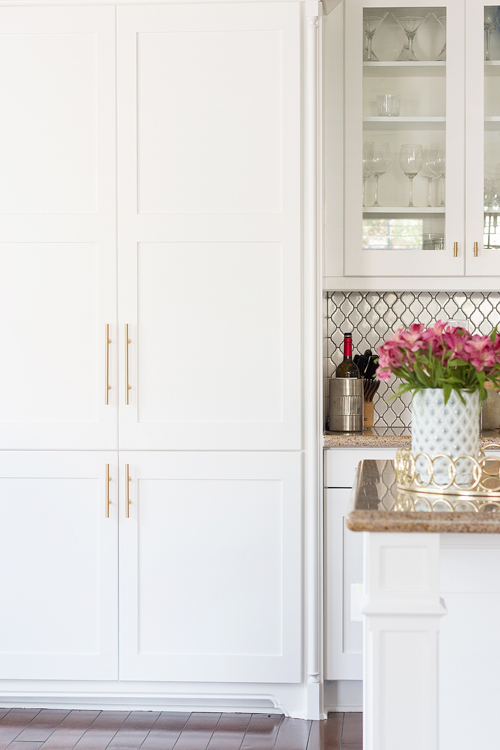 It is always getting in the way of something so since we have a tile backsplash I can't wait to implement your brilliant idea! Thank you heaps!!! I love your cabinet hardware. Do you mind sharing where you got them? 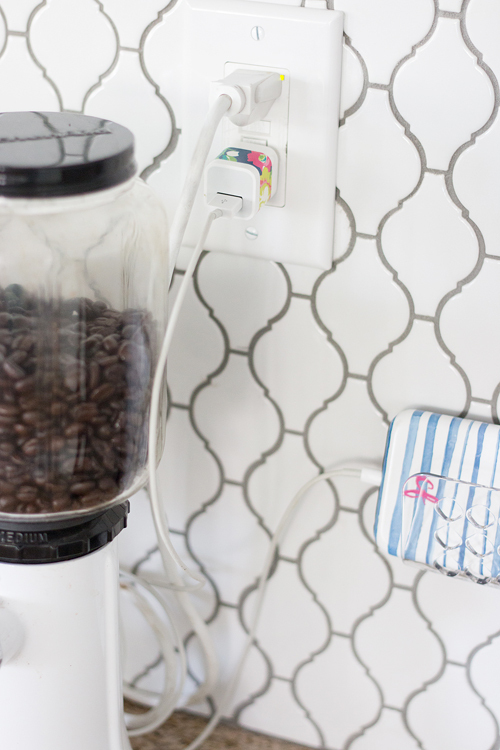 Can you share the link for your coffee grinder? ?